The European Union (EU), on Wednesday commended Governor Henry Seriake Dickson of Bayelsa State for his administration’s massive investment in health and education. The commendation was also premised on his decision to ensure provision of an enabling environment for investors to do business. EU Ambassador to Nigeria, Michel Arrion‎ gave the commendation when he paid a courtesy visit to Dickson at the Government House in Yenagoa. Arrion who is on a three days visit to Bayelsa State said he was overwhelmed at the quality of schools and health institutions built by the government and expressed the EU’s desire to support Bayelsa in key sector of the state’s economy. According to him, Bayelsa State has benefited from its programmes since 2008 through some of its development partners. He stressed that the EU’s focus on going forward would, among others, be centred on technical and vocational education. While maintaining that the EU’s interest will also be geared towards creating more jobs and boost the state’s economy, he urged the government to identify other areas of interest for investment. 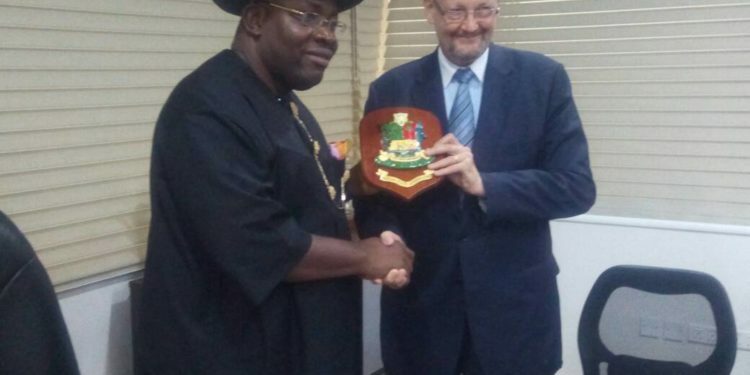 The EU Ambassador ‎told his host that because of the historic ties and values between Africa and Europe, a lot of Europeans are eager to come and put their money and Bayelsa is one of the fancied destinations for them. The Governor, in his response, thanked the EU Ambassador for finding time to visit the state and for going round to see some projects of his government ‎also extended his hand of partnership to attract more investment in Bayelsa State. The governor equally used the meeting to inform the EU Ambassador of other‎ projects that his government is putting in place like the Industrial park and international airport that will further stimulate the economy and create lots of jobs.